This tiny Broadway treasure, built in 1912 as the Little Theatre, takes on Act II as the theater transforms to a colorful space taking cues from today’s digital world! The skilled artists and theater renovation specialists at EverGreene Architectural Arts worked with Second Stage, and architect/theater designer David Rockwell and the Rockwell Group, to launch the Helen Hayes Theater into the future, revealed in a lighting ceremony February 5. Quoted from Rockwell Group: “In playing with the ghost of the original theater, Rockwell wanted to evoke the spirit of the Little Theater. 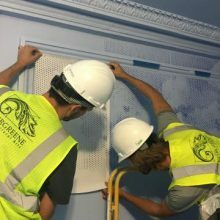 One of main elements of the renovation is a mural that takes its inspiration from painted reproductions of French tapestries that adorned the theater. EverGreene hand-painted the mural using a custom glyph typeface to create a pixelated ombré effect from light to dark blue.” During Design Development, EverGreene worked with Rockwell to test intensely saturated artists’ colors and stencil techniques over an ombré gradation background. Samples and mockups by EverGreene artists were crucial to develop precise materials and techniques to create an unconventional patterns for the auditorium walls. Color choice and application matters! 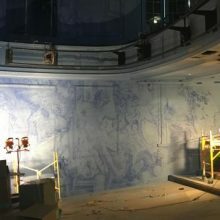 One of the biggest challenges was the actual application of the ombré effect that had to be sprayed continuously to achieve the color gradient from light to dark blue. The precision of EverGreene’s ‘color-mixologists’ use of the spray equipment was crucial.EverGreene’s expertise and innovative solutions allows designers and architects to experiment not only with traditional color and decoration but contemporary, futurist design concepts to give new life to space. 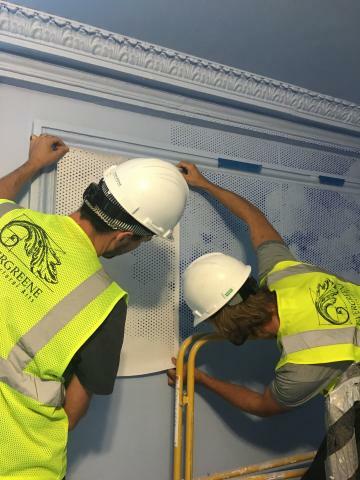 To learn more about how EverGreene can work with your team on contemporary design challenges with color, patterns and materials, please reach out!